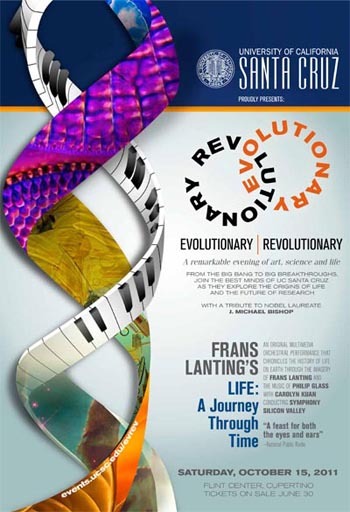 The event will feature Frans Lanting’s Life: A Journey Through Time—an original multi-media orchestral performance that chronicles the history of life on Earth—through the imagery of Frans Lanting and the music of Philip Glass, with Carolyn Kuan conducting Symphony Silicon Valley. The evening will also include a panel discussion featuring the best minds of UC Santa Cruz exploring the origins of life—from the Big Bang to big breakthroughs—plus a special tribute to Nobel Laureate J. Michael Bishop. Moderated by UCSC alumnus Joe Palca, science correspondent for NPR, the distinguished panel of speakers will include Sandra Faber, professor and chair of the UC Santa Cruz Astronomy and Astrophysics Department; Richard E. (Ed) Green, assistant professor of Biomolecular Engineering; and David Haussler, professor and director of the Center for Biomolecular Science and Engineering. For more information, call (831) 459-1438 or contact specialevents@ucsc.edu.